I’m sorry for my lack of posts! I’m going to try to come around more often and say hi. This is a shot from the inside of One Lucky Duck in Gramercy, NYC. 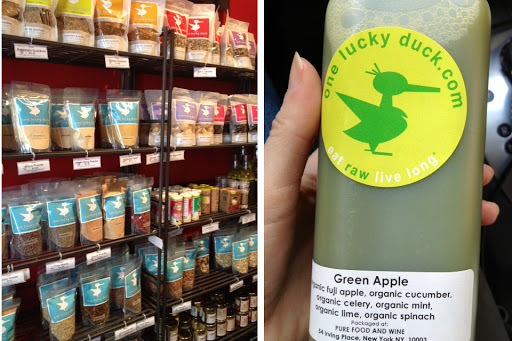 I don’t go here often because it is super-expensive, all raw food. I’ve had a few Dr’s appointments nearby and always seem to justify that I deserve a treat after being at the not so fun Dr’s. Fair enough right? 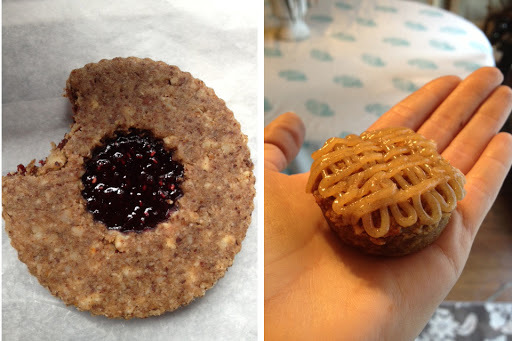 I had to get this raspberry linzer cookie which I gobbled up in a hot minute & that mini cupcake in the palm of my hand was the best raw carrot cupcake I’ve ever had. Maybe not so much worth $5 (I told you it was expensive!) but definitely inspired me to look up recipes to make my own! I also wanted to try something savory, so I ordered the Spicy Thai Lettuce wraps. 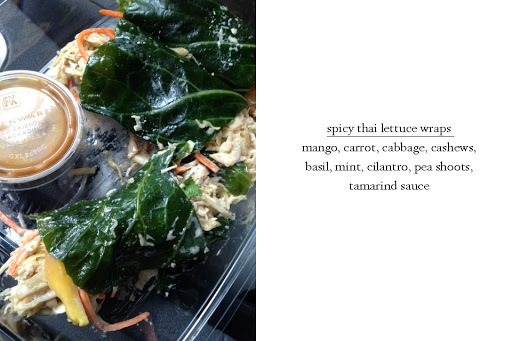 (They were actually wrapped in collards.) Very, very messy to eat. Later I emptied the rolls and ate it like coleslaw. So many delicious flavors in this! 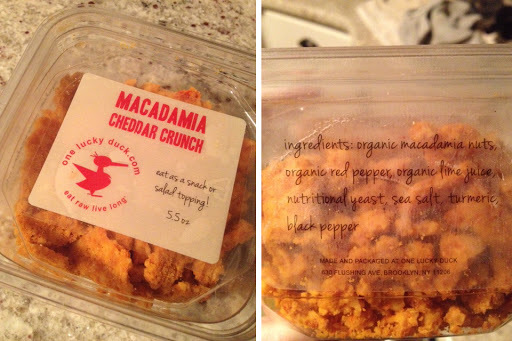 To go, I grabbed some of these cheezy crackers to top my salads off with. They remind me of cheez-its. 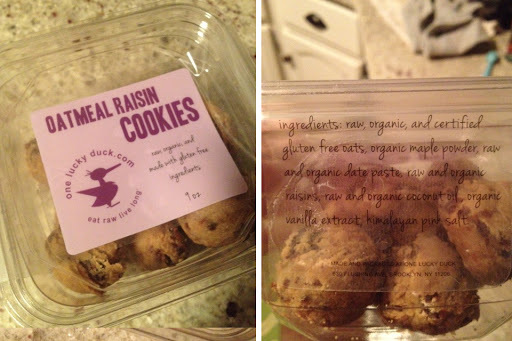 I couldn’t resist the box of raw oatmeal raisin cookies! I have to admit that as much as they are delicious for being all raw, they are almost too dense and heavy for my liking. They are loaded with too much flavor if thats possible? 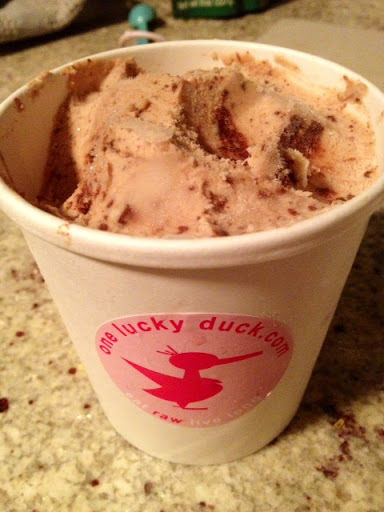 I of course had to bring home a pint of “oreo” ice cream. Yum! 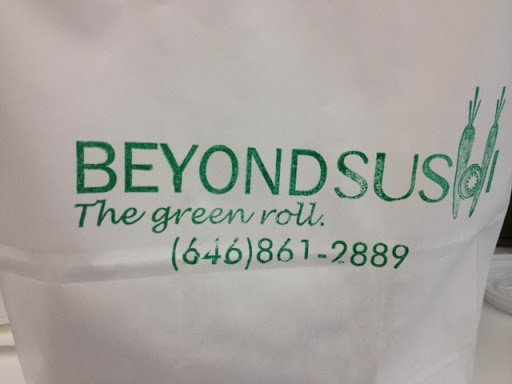 I discovered a new delivery place called Beyond Sushi. 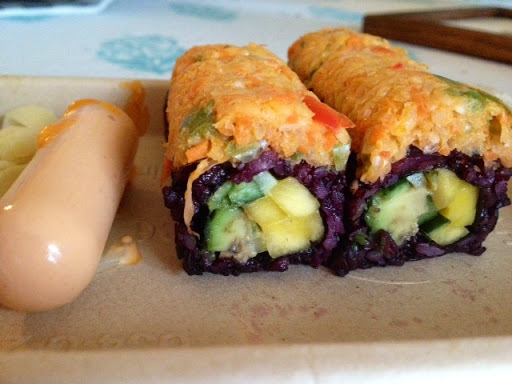 Its all Vegan Sushi! The chef is pretty darn creative over there. He was actually a finalist on Hell’s Kitchen. Each roll and wrap comes with its own little tube of sauce, in which you squeeze out onto each bite. Very innovative! 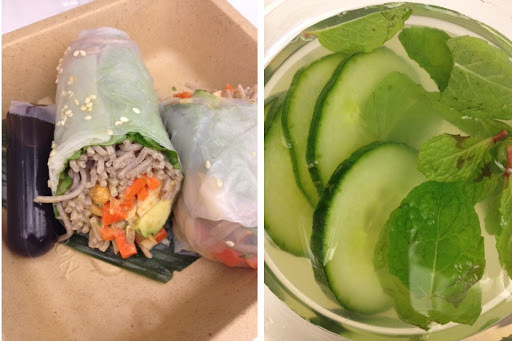 This was a buckwheat peanut rice wrap which was great. My favorite part of the meal was the Cucumber, Lemon & Mint drink. What a delicious combo. Must re-create at home! 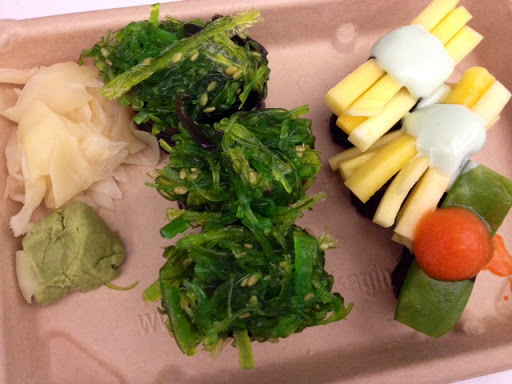 Individual pieces- seaweed, mango and snow pea. I have been loving cherry tomatoes lately. Just the color alone makes me happy! 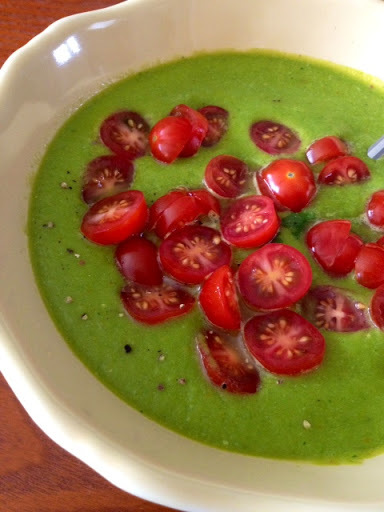 This was a raw green soup I blended and added a bunch of tomatoes to. 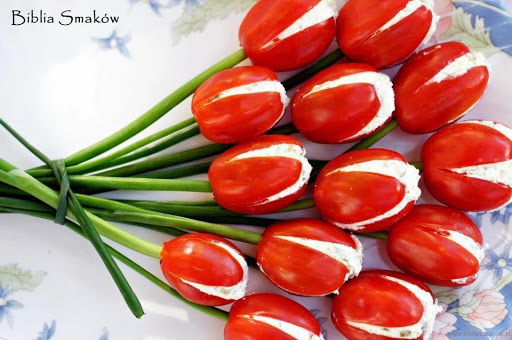 For Easter I think I’m going to make this tomato “tulip” appetizer. I am going to make a basil chive cashew cream to fill the tomatoes. One day for an afternoon snack I ordered delivery from one of my favorite juice bars, Liquiteria. 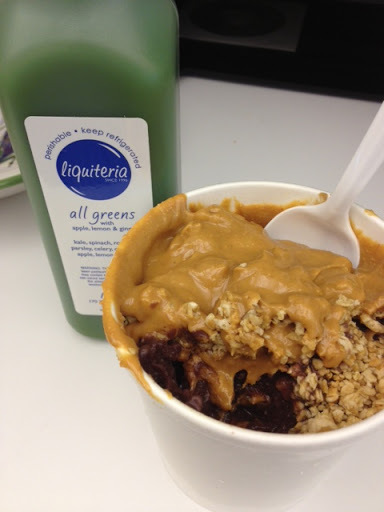 I was excited to see this new addition on their menu – PB Acai Bowl. It was a blended mixture of frozen acai with banana’s and topped with granola and organic peanut butter. I’ve been craving peanut butter lately, so this hit the spot!! 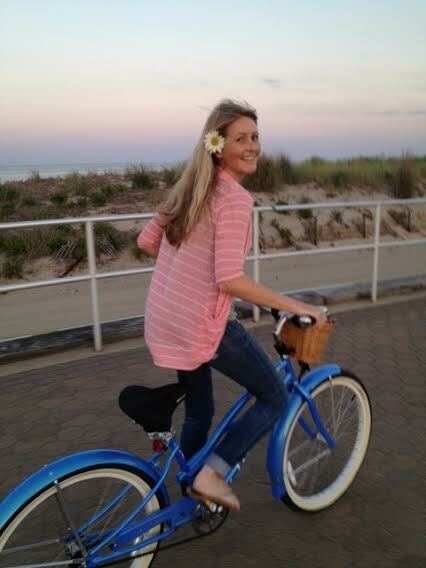 We had some warm weather visit us here on the East Coast last week. I was excited to pull out the patio furniture and soak up some REAL Vitamin D. We were feeling so festive that we invited some friends over to grill. 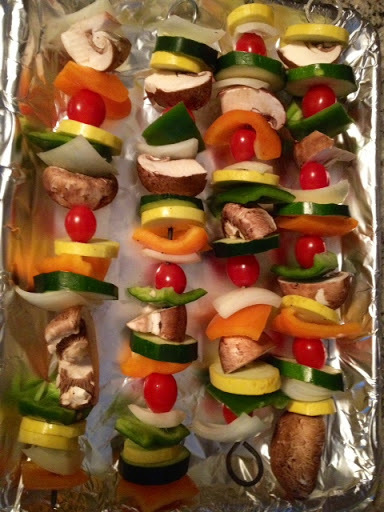 I made these colorful veggie kebobs. Before grilling I brushed on a marinade of olive oil, soy sauce, garlic and salt. Turned out so yummy…cant wait to make more! 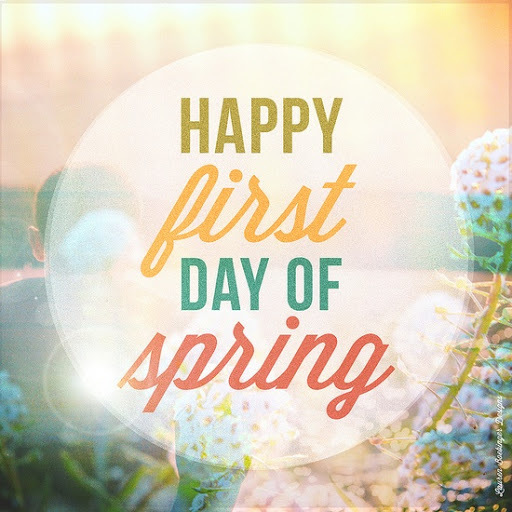 That good weather didn’t last too long! Winter wants to show us its last snowfall before Spring makes its way in. Those are the days you can find me sipping on hot soups & tonics! 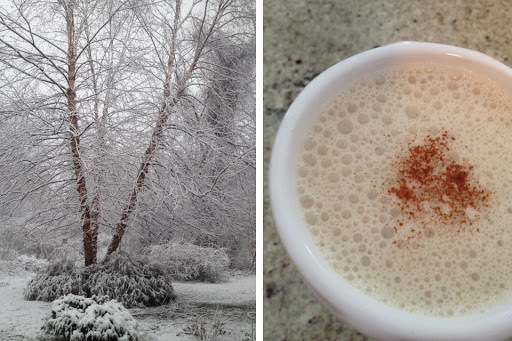 Hot tonics are so nutritious and such a yummy treat to have at night or even for breakfast. First you need a base- any hot tea you would like. Next you need a good fat to make things creamy- either a scoop of coconut oil, coconut butter or hemp seeds. Next a sweetener (few drops of stevia and/or a few dates) Next comes the fun stuff- superfood powders, mushroom powders, vanilla, cacao, cinnamon…etc. 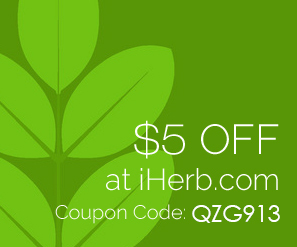 Blend and enjoy! Here is my favorite tonic recipe. 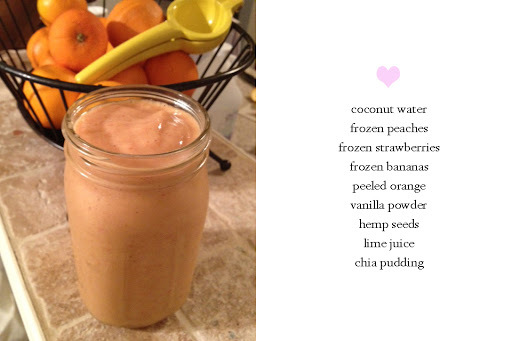 Currently, this is my FAVORITE smoothie. I have been having one every morning for a week straight!! 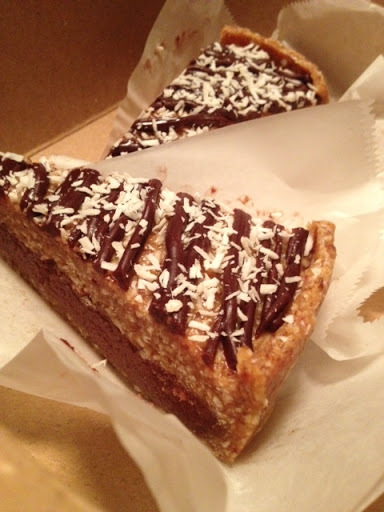 Lastly, my boyfriend came home one night and surprised me with two slices of the most scrumptious raw pie from our local raw restaurant From Seed to Sprout- it was Samoa (Girlscout) flavor!!! He is the best! They tasted EXACTLY like the cookie.